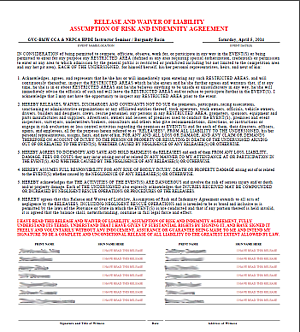 This week we released a new report for BMW CCA clubs- Release of Waiver and Liability Form. We worked directly with the BMW CCA National Office on this one and have their official approval. You'll find it in the Reports section of the Admin beneath the Detailed Reports (One-Pagers) section. And in case you missed it last year, we have a Release and Waiver Liability Form specifically for our PCA regions as well. It's approved by the PCA National Office, includes their official language and all of the other features noted above. Questions? Give us a call, we'll walk you through it.